A committee that advises the government on cancer has said children are more vulnerable to asbestos than adults over their lifetime. It says a five-year-old is five times more likely than an adult of 30 to develop mesothelioma, a type of cancer linked to asbestos, if they are exposed to it at the same time. This is because a child will normally live longer and have more time for the disease to develop, it says. Campaigners are calling for the material to be removed from all of England's schools. The government says there is no evidence that children's lungs are more susceptible to mesothelioma, only that the risk to them is greater because of their life-expectancy and the time it can take for the disease to develop. And it says that the accepted advice remains that it is safer to leave asbestos in place unless it is damaged or disturbed. The Committee on Carcinogenicity, an independent committee that advises the government on cancer, was asked by the Department for Education to look at the relative vulnerability of children to asbestos compared with adults. In its final report, published today after a two-year study, it says: "Because of differences in life expectancy, for a given dose of asbestos the lifetime risk of developing mesothelioma is predicted to be about 3.5 times greater for a child first exposed at age five, compared to an adult first exposed at age 25 and about five times greater when compared to an adult first exposed at age 30." But the picture is complicated, with the experts saying there is a "number of uncertainties and data gaps". The report continues: "From the available data, it is not possible to say that children are intrinsically more susceptible to asbestos-related injury. However, it is well recognised... that, due to the increased life expectancy of children compared to adults, there is an increased lifetime risk of mesothelioma as a result of the long latency period of the disease." The experts say that although there is good evidence that childhood exposure to asbestos can cause mesothelioma in later life, data is too limited to say whether children are more intrinsically susceptible to the disease. About three-quarters of England's 24,000 schools are estimated to have some buildings with asbestos, the study says. Asbestos is a building material commonly used in the UK from the 1950s to the 1980s, often in fireproofing and insulation. It becomes dangerous when disturbed or damaged because fibres can break off and get in to the air, where they can be breathed in. Its fibres can damage the lungs and cause diseases. The government says the Health and Safety Executive advice is that if asbestos is not disturbed or damaged, then it is safer to leave it in place and monitor it carefully. A spokeswoman for the Department for Education said: "We welcome the Committee on Carcinogenicity's report on the effect exposure to asbestos can have on children, and have committed to consider the findings when reviewing our policy on asbestos management. 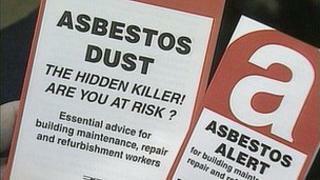 "Schools already must comply with the strict legal duties on asbestos. We have also published guidance on the issue and work closely with the Health and Safety Executive (HSE) to ensure asbestos is managed properly in all schools." Campaigners want the government to pledge to remove asbestos from all of England's schools over time. Michael Lees, the founder of Asbestos in Schools, said: "We want them to look at their policy which says it is safer to leave it than move it and we want them to have an audit to see how much fibre is there. "They have committed to removing asbestos in schools in Australia but people need this done here." The Department for Education said it was working hard with the HSE to make sure asbestos is managed properly in schools and that schools have to comply with "strict legal duties on asbestos".